Franny is the Learning and Development Manager at Bullhorn. 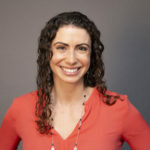 Prior to Bullhorn, she spent almost 5 years at Tufts Health Plan as Corporate Training Specialist and Wellness Coach. She has her bachelor’s degree in Biology from the University of Michigan and MS in International Public Health and Epidemiology from Harvard. Franny’s interests range from salsa dancing to flipping tires at CrossFit, but now mostly spends her free time momming, traveling, and hiking.